Following some recent legislation, it'll be at least seven years before developers are allowed to build a casino in New York City (though we'd happily wait another 50). Until then, New Yorkers craving the sounds of ringing slot machines and clacking poker chips will continue trekking to the same ocean-sprayed resort town they've been visiting since the early 1900s: Atlantic City. The cheapest and fastest way to the Boardwalk is a bus that leaves from Port Authority on 42nd St and Eighth Avenue. Academy Bus runs every hour (and sometimes, multiple times per hour) from 8am to 9pm, with roundtrip tickets starting at $40. Watch out, though: different buses arrive at different casinos, so to minimize confusion, pick the route that will bring you closest to your final destination. Depending on when the last time was that you visited, there's plenty new to see in "America's Playground," which in 2012 opened Revel, a glittering $2 billion casino at the northern end of the boardwalk. Though it may not offer the cheapest rooms in town, a walk through its humongous atrium lobby (whose five levels are connected by the most vertigo-inducing escalators you've ever seen in your life) is an absolute must. Once you've arrived in the Sky Lobby, stroll out onto the wraparound sky deck, which offers stunning views of the ocean and beyond. Manhattan may have MoMA, but over in the Marina District of AC, a brand new sculpture garden opened up this summer featuring some of the city's most impressive public art. The mile-long walkway connects Golden Nugget to Harrah's, and with its 40+ sculptures fashioned by local and national artists, offers a scenic place to hide out and enjoy a more peaceful side of the city. Though your first instinct might be to head for the blackjack tables, we have another idea for an afternoon of mindless fun: Steel Pier. The waterfront mini-amusement park dates all the way back to 1898, though plenty of awesome new rides have been added since then (Slingshot, anyone? ); best of all, single tickets start at just $1. 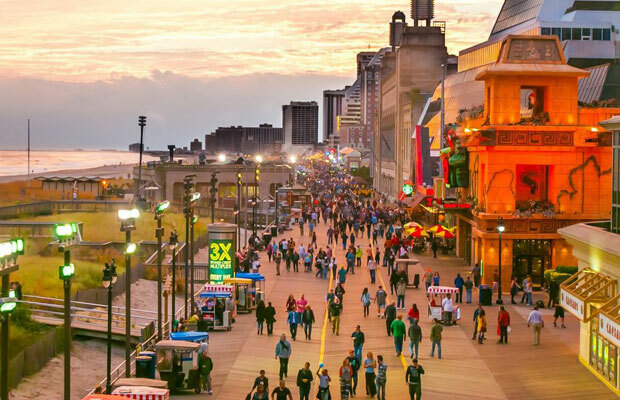 Of course, all that boardwalk-trotting and reverse bungee catapulting is going to work up an appetite – good thing, then, that the dining options in Atlantic City feature a solid mix of international eateries, celebrity chef outposts, and old-timey neighborhood institutions. Of the three we just mentioned, our favorite might just be the latter, and you can't get much more old-school than Teplitzky's. The vintage-inspired diner, which serves classic brunch fare like French Toast, omelettes, pancakes, bacon, and hash browns, takes its name from a 1960s guesthouse that existed in the same spot. This one's easy: Book an over-nighter. You can't very well show up to a resort city as visually spectacular as Atlantic City and not spend at least one night soaking up the faux-opulence of Trump Taj Mahal (from $69 a night) or living it up in style at Borgata (from $89). Not to mention, the cost is a fraction of what you'd pay for the same room in NYC.